HOUSTON, TX, UNITED STATES, July 10, 2018 /EINPresswire.com/ -- Rampart Products is an up and coming player in the HPHT injection molded connector market, proving to be a disruption that has industry people taking notice. While competing in a space that has long been dominated by two manufacturers, they have shown to continually innovate and not be satisfied with the status quo. The latest example of innovation from Rampart Products is their effort to find a material solution for a molding challenge faced with the new HPHT Rotatable recently released for production. Rampart’s engineers worked closely with the engineers at Victrex to use available materials blended in a manner not considered previously. 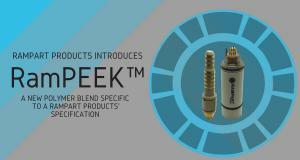 The result is a new polymer blend specific to a Rampart Products’ specification, which has since been named RamPEEK™. RamPEEK™ has a combination of mechanical and physical properties that are superior for molding electrical connectors. The material has equal strength, yet is 2X easier to mold; perfect for slender connectors or tightly packed multi-conductor connectors with a similar cost. Rampart Products is a manufacturer of injection molded products, specializing in the processing of materials in the PEEK family. Rampart’s expertise is creating a HPHT electrical connector with a hermetically sealed interface. This process knowledge has allowed for rapid innovation and manufacturing efficiencies leveraged to better serve the end user. Victrex has more than 35 years of knowledge in developing and applying novel PEEK polymer based solutions. Full traceability, testing beyond standards and more than 50 quality tests per batch enable performance in the harshest operating conditions.